Having given the visitor some impression of the City side of Liverpool, we now propose to make an excursion to other streets of an interesting character. 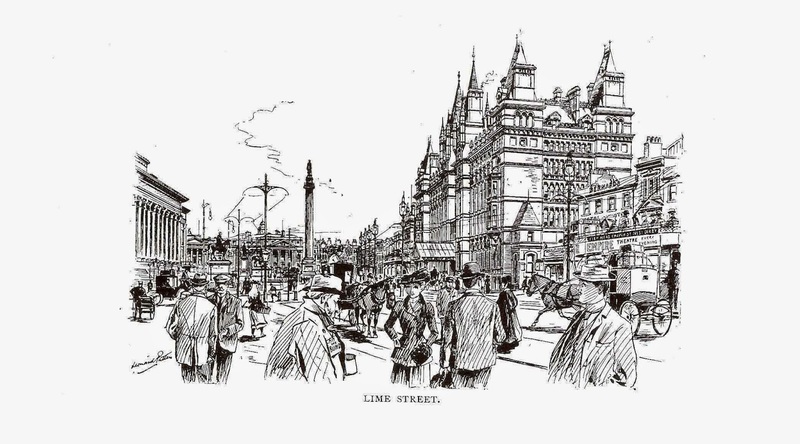 Starting from the pavement at the great North Western Hotel, we cross the entrance to the Railway Terminus, and, bearing to the left, pass into the narrowest part of Lime Street. Lying to our west is a very busy neighbourhood. The first turn to the right, through Elliot Street, conducts us to the finest Market in Liverpool. St John’s Market is one-eighth of a mile in length, and was finished in 1822, at a cost of £36,813. There are no fewer than three Squares in close proximity to St. John’s Market, and in each of these we find a place of amusement. Elliot Street leads direct to Clayton Square, where the Prince of Wales Theatre is situated. By turning through Great Charlotte Street we enter Queen Square, which is quite the “Covent Garden” of Liverpool. Partly facing this busy place is the Royal Court Theatre. Occupying the ground where the Copperas and Brownlow Hills meet in Ranelagh Place, is the fine Adelphi Hotel, the property of the Midland Railway Company. A short distance up to the right of Copperas Hill, in the unlovely Hawke Street, is the Roman Catholic Pro-Cathedral of St. Nicholas, with a fine marble altar by Pugin. At the top of the hill we notice the spire of St. Simon’s Church. Directly facing the Adelphi Hotel is the important Ranelagh Street, from which we gain access to the Central Railway Station, and at its western end, thirty feet below the ground, the Station of the Mersey Railway. By this underground line we can travel via James Street Station and under the Mersey, through a tunnel 3690 feet in length, to Birkenhead and other stations in the Wirral peninsula. Some ninety trains run daily each way. The Railway was opened in 1886 by His Majesty King Edward VII, then Prince of Wales. The handsome Central Station, a four-storey stone building with single span roof 65 feet in height, is a terminus of the Great Northern, Midland, and Great Central Railway systems. Looking up Mount Pleasant from Ranelagh Place, we notice on the right the French Gothic Tower of the Y.M.C.A., some 100 feet in height. 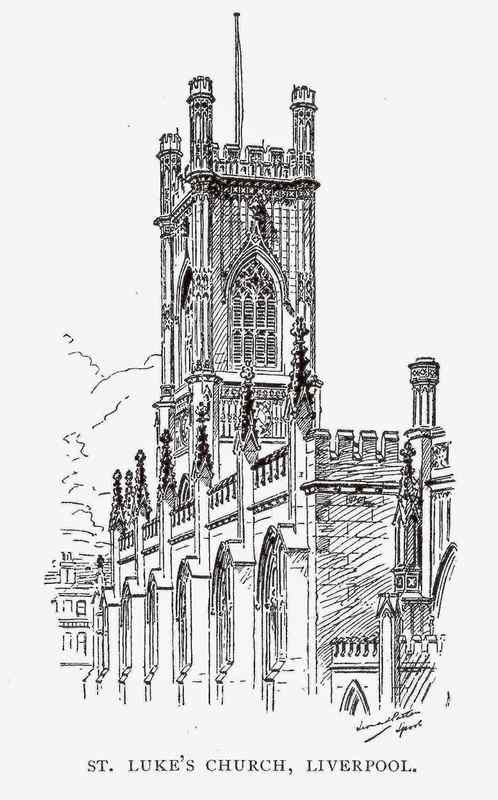 This is one of the finest Institutions of its kind in the kingdom, opened by the late Earl of Shaftesbury in 1877, the foundation stone having been laid by the late well-known Evangelist, Mr. D. L. Moody. We now pass along Renshaw Street. This narrow thoroughfare promises to be one of the most important in Liverpool. Recently it underwent a great transformation, being renovated and widened from end to end. In the distance we notice the turreted tower of St. Luke’s, one of the leading Liverpool Churches. A little way up Renshaw Street on the right hand, the Deutsche Evangelische Kirche (1777), and further on to the left the Renshaw Street Unitarian Chapel with its Ionic portico. This well-known Chapel where Charles Beard preached, and William Roscoe was buried in 1831, is now closed, and the congregation have removed to their new Chapel in Ullet Road, Sefton Park. St. Andrew’s Church, with which the father of the late Right Hon. 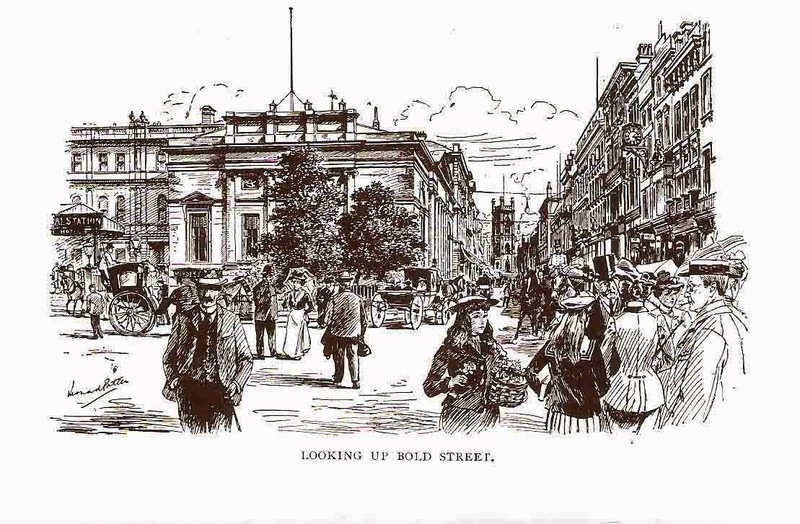 W. E. Gladstone was largely associated, stood almost facing the Unitarian Chapel, but it has been demolished, and the Roscoe Arcade which formerly existed near at hand has shared the same fate, both making way for improvements. On reaching St. Luke’s Place, we arrive at an important junction of busy streets. To our immediate left, the rather steep incline, is Leece Street, leading to Hardman Street, at the summit of which the corner of the Philharmonic Hall and the Eye and Ear Hospital are noticeable. Directly facing us is Berry Street, also lately widened and improved, leading to Great George Street. By turning sharply to the right we enter the well-known Bold Street. A word must be said about the very perpendicular looking St. Luke’s Church (already alluded to), which here stands out so prominently. This Church was built at a cost of £44,000, and seats 1,250 people. 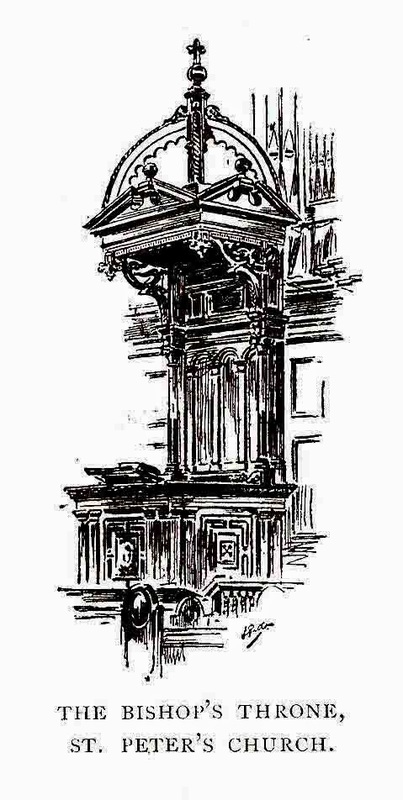 The tower, 137 feet in height with a fine peal of bells, has the advantage of standing in a most commanding position on a wide flight of steps at the head of Bold Street. The highly decorated interior, with its stained glass windows, is decidedly pleasing. The chancel is modelled from the well-known Beauchamp Chapel at Warwick. New buildings are being erected on the left side of Berry Street, which, when completed, will greatly improve the appearance of the neighbourhood. At the end of Berry Street, where we cross Duke Street and enter Great George Street, a large dome-topped building is prominent. This is considered to be one of the finest buildings belonging to Chapel the Nonconformists. By a wide flight of steps we pass through the circular portico. The leading features consist of the ten fluted Corinthian columns, the shafts of which are in single blocks of stone. A fine marble bust of Thomas Raffles, for 49 years minister of this congregation “the eloquent preacher, the sound divine, the faithful and genial friend ”stands in the entrance porch. The seats are so admirably arranged that it is possible for every member of the congregation, being seated, to see their minister. Now we will walk down Bold Street. 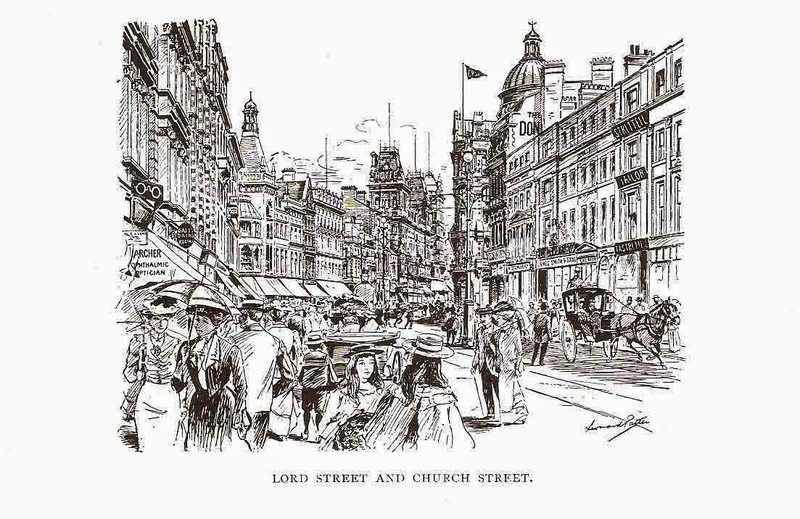 This is the Regent Street of Liverpool, and forms with its continuation of Church and Lord Streets, for three-quarters of a mile in length, one fine double row of first class shops of all descriptions. The upper end is narrow, but the street widens as one proceeds downwards, and at night the thoroughfare is admirably lighted by pendant electric lights in the middle of the roadway. Compared with the splendid buildings of the City, those of Bold Street may seem unpretentious. There are, however, some buildings which the visitor would do well to note. At the top of the street, we notice the unusually open porch of the London City and Midland Bank. A narrow opening on the left - Colquitt Street, contains the Apothecaries’ Hall, an ornamental building of freestone. Near by is the ancient building of the Royal Institution, formerly used in part as an Art Gallery, and still the resort of the scientific and literary. It was established as early as 1814. We shall be struck by the massive front, with its figures of Hisculapius and his daughter Hygeia, the curious kneeling bull brackets, and the ornamental snake entwined lamp standards. Emerging again from Colquitt Street we see the large office of the Liverpool Savings Bank. Continuing down Bold Street a frontage most likely to attract our attention is Lloyds’ Bank, on the right, with lofty granite entrance. As we approach Church Street, we pass on the right the fashionable Palatine Club, with its Italian Renaissance facade, and at the end of Bold Street, adjoining the entrance to the Central Railway Station, is the Lyceum Club and the Liverpool Library. This is in the Ionic style, and was built in 1802. The News Room in this building measures nearly 70 by 50 feet. Here, at the junction of Ranelagh and Church Streets with Bold Street, the traffic becomes very congested, but as we approach the point where Parker Street from the right side enters Church Street the road widens. Opposite Parker Street is the Athenaeum Library and News Room, which, founded by William Roscoe and Dr. Rutter in 1798, possesses many valuable books. A very fine spectacle here meets our eye. It is difficult to specialize, but we cannot fail to mark the handsome frontage of the City Chambers at the corner, and the fine Compton Hotel a little way along Church Street. Opposite the latter is situated, in a little oasis in the midst of lofty buildings, St. Peter’s Church, from which the street takes its name. This unimportant looking Church, with its diamond panes and dingy exterior, is the oldest Church in Liverpool, and at present does duty as the Cathedral. It is wholly unworthy of such a dignity, but, as we mentioned, the diocese is at last bestirring itself to erect a Cathedral that shall bring honour to the City. What was possible has been done. Daily Service is held in the Church, and the singing is quite excellent. The Church was built in 1704, and contains some good oak carving, notably the reredos. The curious tower, which has a fine peal of bells, is 108 feet in height. Standing near one corner of St. Peter’s Garden is the highly ornamental turreted building, with its gilded courses, belonging to Messrs. Russell. On the facade facing the Garden are clocks giving the time of day in various parts of the world. Behind and facing the Churchyard is the quadrangle of the Blue Coat Hospital School, founded by Bryan Blundell in 1708. The Hospital will shortly be removed to new buildings situate at Wavertree, erected at a cost of £90,000, from the designs of Messrs. Briggs, Wolstenholme, Hobbs, and Thornely; they will accommodate 250 boys and 150 girls. Proceeding down Church Street, the visitor reaches a very busy spot, at the point where Paradise Street and Whitechapel cross our line of route, the corners of which are marked by lofty buildings. It is curious to recall that along here flowed one of the streams of the Pool. At this point Church Street passes into Lord Street: Whitechapel, the street on our right and a rather different place from the London locality of that name, leads to Lime Street; while Paradise Street, on the left, leads to the Customs House. Architecturally the lower part of Lord Street is the more interesting. Note especially the Oxford and Cambridge Chambers on the right. Nearby, also on the right, a handsome new Arcade has recently been completed. The next cross thoroughfares are North and South John Streets. Looking down the former we note the offices of the Royal Insurance Co., and the ' fine Central Buildings. 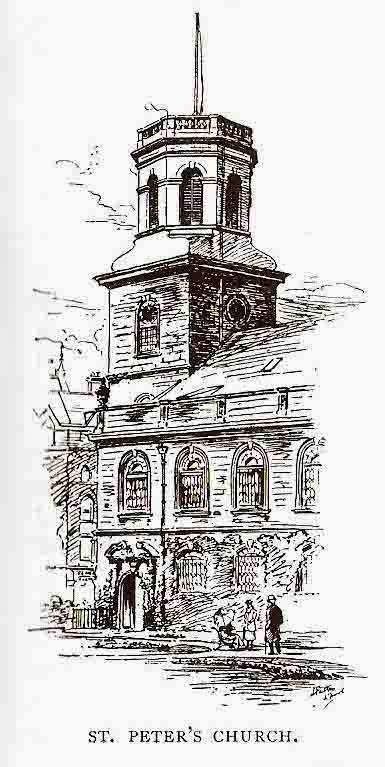 At the corner of South John Street, we see the newest ecclesiastical building in Liverpool, the handsome structure of the Church House, which has been erected to provide accommodation for meetings, of Societies in connection with the work of the Church of England. The late Bishop Ryle, of Liverpool, gave £1,200, and some 5,000 theological volumes to this Institution. The upper part of Lord Street terminates in Derby Square. We have already noticed in a former ramble the objects of interest which lie to our right and left here in the Castle Streets, so we cross the Square and enter James Street. This short thoroughfare leads down to the busy neighbourhood of the Docks and Landing Stage. The fine tower and building of the James Street Station of the Mersey Railway, the premises of the Dominion Line of Steamships, and the magnificent office building of the White Star Company are noticeable. On the left of this street are seen the Alexandra Buildings, the Leyland Line Offices, and the very pleasing Tudor facade of the Pacific Line Offices. Crossing the road, turning to the right and passing the curious antiquated Arcade of the Goree Piazza, we terminate our present tour.